See how pretty I am?- mostly white with just a touch of blue. I`m a shy, but sweet, little girl named Carli who desperately wants a friend. 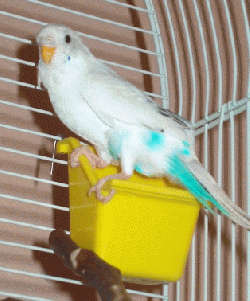 You see, I`m currently sharing a cage with a couple of green budgies, Maya and Thandie, who are pretty chummy. We all came from an animal shelter together. Although they are not mean to me, I still feel kind of left out. My foster Mom tells me that really soon I`ll be moving in with 5 other girls -- kind of like a dorm! We`ll be like sorority sisters. Maybe in there I`ll find someone who has interests like me, and we can be best buddies!. I like to nibble on wheat grass, swing on the swing, flit about here and there and chatter to the other budgies that I can hear, but not see, yet. I think I can see a bird in the mirror that looks just like another young lady like me. I`ve tried striking up a conversation with her but she just doesn`t talk back. She`s cute as a button though -- just like me! Sometimes I`m so lonely I sit next to the plastic bird in my cage and pretend it`s my friend. Everybody wants a best friend -- maybe that could be you. Or maybe, you can adopt both me and another budgie to be budgie buddies! I`d really like that, wouldn`t you?